Imagine if you could have an eyelash extension job in Houston where you set your own schedule and worked whenever AND wherever you wanted to? Imagine taking off whenever you needed to without having to ask permission? Imagine if you could have a lash extension artist job in Houston where you earned up to 4x than you could in a salon.…earn $50 to $65 per hour? Imagine being free from being locked up in a tiny room and instead provide lash extension service in Houston in wide open spaces and meet high quality clients? Well, imagine no more…..Eyelashr is here! Eyelashr, the world’s first “Uber of Eyelash Extensions” will set you free! YOU can finally have that freedom to control your schedule and life that until now has only been a dream! Apply to become an Eyelashr Lash Extension Stylist in Houston. How does the Eyelashr concierge eyelash extensions service work? You Customers pre-pay and book an eyelash extension service in Houston through the eyelashr App to be delivered at their preferred location and time. You drive to the client’s location and complete the requested eyelash extension job. What do you need to apply for this eyelash extension job opportunity? Licensed to perform eyelash extension work. Experienced in applying high quality eyelash extensions. Your own eyelash extension supplies and a portable massage table. A smart phone to view and manage your Houston eyelash extension jobs through the Eyelashr App. Apply to become an Eyelashr Lash Extension Stylist Now! How Eyelashr provides scheduling support & invests in advertising to bring you bookings! You will get a web page dedicated to you that our digital marketing team will set up for YOU! Images of your work examples will be uploaded for Houston lash extension clients to view and book YOU! Reviews from clients you deliver eyelash extension services to in Houston will be shown to build your reputation so you get more bookings. Eyelashr invests HEAVILY into online and offline advertising and marketing to bring YOU bookings! Eyelashr sales reps are trained in selling eyelash extension service and answer all the customer calls so you can focus on lash extensions! We provide you a team of customer service agents that work 6am to midnight to take care of ALL customer booking issues. You can call customer service anytime, we are here to support you! All client billing is taken care of by our agents and automated credit processing systems. You get a detailed report online that you can access at any time to see each Houston eyelash extension appointment you serviced and the exact amount you received for that service! Imagine the freedom you’ll have when all the administration, booking, re-scheduling, billing, marketing and advertising is all done for you! Apply now to start delivering concierge eyelash extension service around Houston! You set your standard weekly availability. login to the Eyelashr Lash Extension jobs management app and set your standard weekly Availability Schedule. Set the areas you want to accept eyelash extension jobs in your city. A list of areas in your city are available for you to check on or off. Check the areas you would like to serve to accept eyelash extension jobs. Set your unavailability – automatic calendar syncing. Want to take time off? Have a personal appointment you need to attend? Set recurring appointments like lunch, routine errands or commitments or any other activity. With Automatic calendar syncing, no eyelash extension jobs are booked during that unavailable time. That’s it! You just set your availability and use your calendar like you normally do. Like magic lash extension jobs appear on your calendar with all the information you need to deliver the eyelash extension job. Apply to become an Eyelashr Houston Lash Extension Stylist Now! About the founder who is on a mission to fill your books with eyelash extension jobs in Houston! Maher Daoudi is the former CEO, co-founder and current co-owner of Xtreme Lashes Eyelash Extensions located in Houston. With his digital marketing expertise, Maher led Xtreme with his family to become the global leader in eyelash extension training and eyelash extension product innovation within the first year of launching in 2005. Under his leadership, he grew the company worldwide to become the global leader with over 35,000 lash stylists trained in 30+ countries. Maher then co-founded Skillvo and from scratch built a social network platform for service providers. Using his deep eyelash extension experience combined with his digital technology app development and digital marketing experience, he’s now on a mission to make Eyelashr the world’s first and most successful “Uber for Lash Extensions”. Maher is a passionate visionary on a mission to help YOU, the Houston lash extension artist to earn more, control your schedule to enjoy life your way and liberate you from the hassles of complex technology, digital marketing, booking, scheduling, and all that administration that gets in the way of you focusing on YOUR passion….applying amazing lash extensions in Houston! Are you ready to relax more and enjoy much more your free time without being glued to your phone worried about losing clients? Are you ready to earn up to 4x more than the industry average? 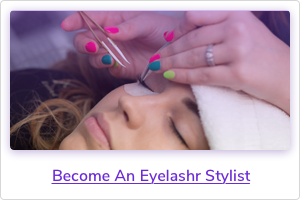 Apply NOW to become an Eyelashr Lash Extension Stylist in Houston! Customers will book eyelash extension jobs that auto sync to your calendar. Eyelash extension jobs automatically appear on your calendar based on your availability and the areas you want to serve in your city. See the lash extension job type (Full Set, refill). See the date, start time and length of time for the eyelash extension job. See the address where you will perform the lash extension job. See parking instructions. Customers reimburse you for parking fees. Houston lash extension job notifications. You’ll get a 24 hour and 2 hour text and email reminders of your upcoming lash extension jobs. Clients can rebook an eyelash extension job with you! If a client likes the eyelash extension job you delivered, they can rebook you to deliver future eyelash extension jobs based on your availability. If a customer needs to cancel or reschedule an eyelash extension job, you’ll be notified by email or text. (You will receive 62% of any rescheduling or cancellation fees charged to the customer). If you have an emergency and need to cancel or reschedule an eyelash extension job, simply call in and we’ll take care of rescheduling the client. Set up auto pay to have your lash extension job earnings deposited straight into your bank account. Payments for your completed eyelash extension jobs are deposited weekly. Our trade secret advanced scheduling algorithm optimizes your schedule to maximize the amount of appointments you receive in a day. We’re ready to serve you, support you, help you earn more income and get rid of all those administration headaches so you can enjoy life to the fullest! Imagine having a full team of marketers, customer service support,and administrators who SPECIALIZE in JUST eyelash extensions to support you! Imagine what you can do when you earn up to 4x more than than the industry average? Imagine what you can do when YOU control your schedule, not an employer or demanding customers – you can take vacations whenever YOU want! Imagine setting your own schedule, your own work area and never having to ask permission to take care of your personal life. Well, imagine no more – eyelashr is here. It’s time for you to enjoy life more often! Apply NOW to become an Eyelashr Lash Extension Stylist! Don’t worry you will not be spammed. Your privacy is important to us.